Sorry to bring this up but it's tax filing time. Heed this fact: the complete tax implications of winning and losing at gambling is pretty much a mystery to gamblers. That is unless you have a copy of Jean Scott's and Marissa Chien's revised and updated second edition of their authoritative book Tax Help for Gamblers. You can avoid a dreaded IRS audit (ignorance of tax laws is no excuse) by following the advice in their book when you file your state and federal taxes. Read more by clicking here. We've postponed the second part of Vinny DeCarlo's article (Turning the Tables on Surveillance) until the March BJI and in its place we have another groundbreaking story by Vinny. This month he has the inside scoop on the status of casino surveillance in several Colorado casinos. I attended the 2014 Blackjack Ball last month and report on what went down at this annual get together of blackjack pros (my report includes this year's Blackjack Ball test questions... give it a try). We have several blackjack reports this month that include three North Las Vegas casinos (Opera House, Silver Nugget and Jerry's Nugget by Stu D. Hoss); two casinos located on Tropicana Ave. at the south end of the Strip (Hooters and Orleans by KC Brooks); three located in central Kansas (Prairie Band, Golden Eagle, and Sac n Fox by JPB); and all the casinos in Atlantic City (by Frank Scoblete, who also reports on the recent demise of the Atlantic Club casino in his report). Kenneth Smith recently spent some time in New Jersey to check out the new online gambling being offered there and reports on what he found. John Grochowski responds to questions dealing with why casinos offer bad video poker and 6-5 blackjack games, and the bonuses on video slot machines. Jerry "Stickman" presents playing strategies for short-pay deuces wild video poker games, including NSUDW. 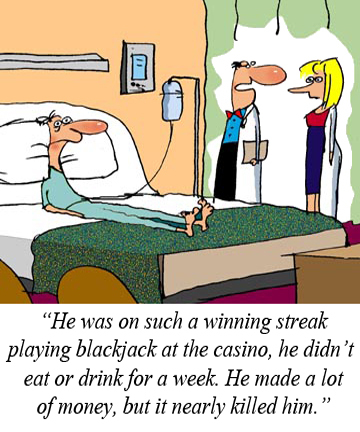 Lastly, we have a summary of major blackjack tournaments courtesy of blackjacktournaments.com. Seasoned gambling pro Jean Scott and Enrolled Agent Marissa Chien (also a gambler, but more importantly, a professional tax consultant) have compiled the most comprehensive, authoritative, and up-to-date book available on the subject of gambling and taxes. (This is the newly revised and updated second edition). To order the (discounted) book, click here. Copyright ©2014, Jerry King, www.jerryking.com. All rights reserved. This article, which appeared in issue #130 of BJI, is a great primer on taxes and gambling. (See also our Product of the Month). Visit the Blackjack page on www.Saudicasinos.com the #1 Casino portal in Arabic - Win real money in online Blackjack!. "The amazing story you about to read about casino surveillance in casinos in Colorado is true and based on a visit I made there..."
"Get the inside scoop on the recent gathering of blackjack pros from around the world, including the 21-question Blackjack Ball test..."
"There is another Las Vegas that many readers and even residents of the Las Vegas Valley aren't familiar. It's actually another city, North Las Vegas. I visited three casinos there and this is what I found..."
"The next few months, I will be reviewing the casinos on the south end of the strip, located on Tropicana Avenue. The casinos include Excalibur, New York New York, Hooters, Tropicana, MGM, and the Orleans. This month I will keep you abreast of the blackjack playing conditions at Hooters and The Orleans..."
"There are three Indian casinos worth noting in northern Kansas that offer blackjack. Two of the casinos offer low stakes betting, generally not worth the drive, but there is one casino in the Sunflower state that offers some attractive blackjack for the basic strategy player, as well as the card counter. All three casinos are located within an approximate 40-mile radius so that you can visit all three easily..."
"Frank Scoblete and his team of reporters provide an update on playing conditions in all the casinos and the demise of another Atlantic City casino..."
"In December, I traveled to the east coast to get some in-person experience with the new games. I must admit, it was a very unusual gambling trip. In a snowy and cold visit to New Jersey, I stayed about five miles from Atlantic City, but never even set foot in a brick and mortar casino. Instead, I was holed up in a hotel room with two laptops, trying out a huge variety of real-money gambling games..."
"John Grochowski answers players' questions on bad video poker and blackjack games, and the free spin and bonus rounds on video slot machines..."
STRATEGIES FOR SHORT-PAY DEUCES WILD by Jerry "Stickman"
"Of all wild card video poker games, the deuces wild category is by far the largest. Countless variations of pay tables provide a nearly limitless selection of deuces wild games for the video poker player. Here's what you can expect..."
"Check out the schedule of upcoming major blackjack tournaments by region in our Blackjack Tournament Report courtesy of blackjacktournaments.com.